Dr. Paul Alkon (in his scholarly work Winston Churchill’s Imagination) describes Man Overboard! 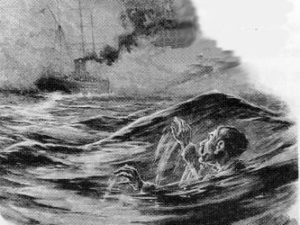 as “justly forgotten,” including Henry Austin’s melodramatic drawings, one suggesting an 1899 version of “Jaws.” Alkon quips that the story “quickly sank out of sight, taking down with it Austin’s pictures.” It does leave us with a glimpse of the shipboard life and song that Churchill enjoyed in those days. The possibility of falling overboard probably occupied our author’s mind during his progresses up and down the Red Sea, en route or returning from India or South Africa. We can conceive of his vivid imagination conjuring what might happen if someone accidentally fell in: the fading music, the dimming light as the ship pulls away, the despair of the victim. The story manifests that streak of fatalism Churchill always carried with him. Here is Churchill’s story, by kind permission of Randolph S. Churchill and the Churchill Literary Estate. The accommodation-ladder had not been unshipped since leaving Aden and the man walked out on to the platform, as on to a balcony. 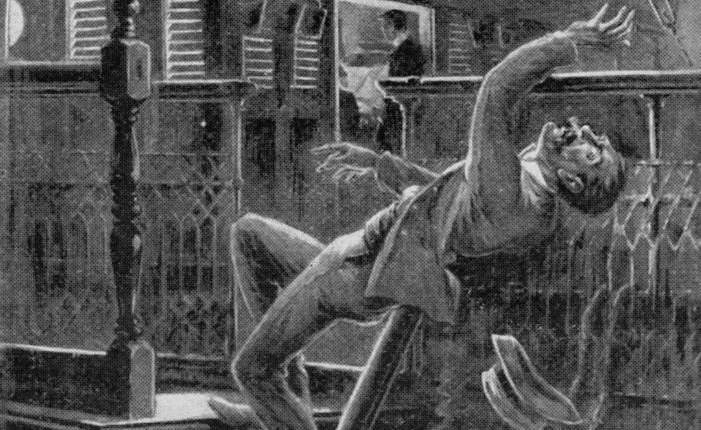 He leaned his back against the rail and blew a puff of smoke into the air reflectively. The piano struck up a lively tune and a voice began to sing the first verse of “The Rowdy Dowdy Boys.” The measured pulsations of the screw were a subdued but additional accompaniment. For a moment he was physically too much astonished to think. Then he realized he must shout. He began to do this even before he rose to the surface. He achieved a hoarse, inarticulate, half-choked scream. A startled brain suggested the word, “Help!” and he bawled this out lustily and with frantic effort six or seven times without stopping. Then he listened. “Help, help, help!” shrieked the man, now in desperate fear. At length full realization came to the man and he stopped swimming. He was alone—abandoned. With the understanding the brain reeled. He began again to swim, only now instead of shouting he prayed—mad, incoherent prayers, the words stumbling into one another. A surge of joy and hope rushed through his mind. They were going to stop—to turn the ship and come back. And with the hope came gratitude. His prayer was answered. Broken words of thanksgiving rose to his lips. He stopped and stared after the light—his soul in his eyes. As he watched it, it grew gradually but steadily smaller. Then the man knew that his fate was certain. Despair succeeded hope; gratitude gave place to curses. Beating the water with his arms, he raved impotently. Foul oaths burst from him, as broken as his prayers—and as unheeded. The fit of passion passed, hurried by increasing fatigue. He became silent—silent as was the sea, for even the ripples were subsiding into the glassy smoothness of the surface. He swam on mechanically along the track of the ship, sobbing quietly to himself in the misery of fear. And the stern light became a tiny speck, yellower but scarcely bigger than some of the stars, which here and there shone between the clouds. Nearly twenty minutes passed and the man’s fatigue began to change to exhaustion. The overpowering sense of the inevitable pressed upon him. With the weariness came a strange comfort—he need not swim all the long way to Suez. There was another course. He would die. He would resign his existence since he was thus abandoned. He threw up his hands impulsively and sank. 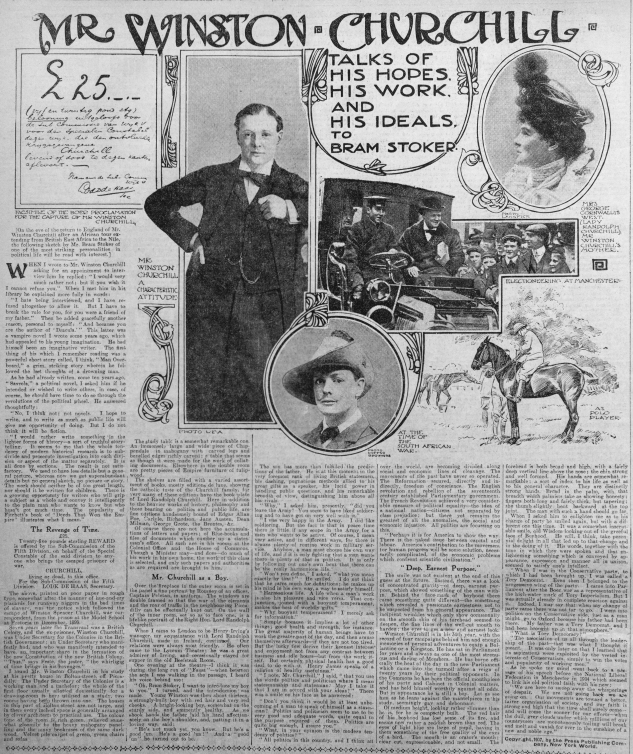 The Stoker interview as it appeared in the Daily Courier (15 January 1908). 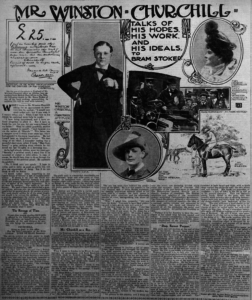 This was actually its third appearance—it was published in the United States on 5 October 1907 by The World (New York City), and on 6 October 1907 by The Evansville Courier (Indiana). Thanks to Professor Antoine Capet for drawing this to our attention on the Bram Stoker website. This latter was a vampire novel I wrote some years ago, which had appealed to his young imagination. He had himself been an imaginative writer. The first thing of his which I remember reading was a powerful short story called Man Overboard! An Episode of the Red Sea—a grim, striking story wherein he followed the last thoughts of a drowning man. Man Overboard! is C72 in my Section C (Articles, Reviews and News Reports from War Zones in Serial Publications). First published in Harmsworth Magazine, Vol. I, no. 6, it reappeared in Argosy (UK) in June 1965. It was also collected in Great Untold Stories of Fantasy and Horror (B292), The Lucifer Society (B195), The Arbor House Treasury of Horror and the Supernatural (B203), Demonic, Dangerous and Deadly (B204) and the Collected Essays of Sir Winston Churchill, Vol. IV. Besides his novel Savrola (Cohen A3), Churchill wrote only three other fictional pieces: On the Flank of the Army (C202, 1901); If Lee Had Not Won the Battle of Gettysburg (C344, 1930); and The Dream (C705, written 1947, first published 1965). —Ronald I. Cohen, author, Bibliography of the Writings of Sir Winston Churchill.